Artist seeks a compromise that protects bathers’ feet but leaves her celebrated 1987 installation piece. Others raise questions about upkeep. Ironically, as part of the project, a unique art piece called “The Oasis” would be removed. 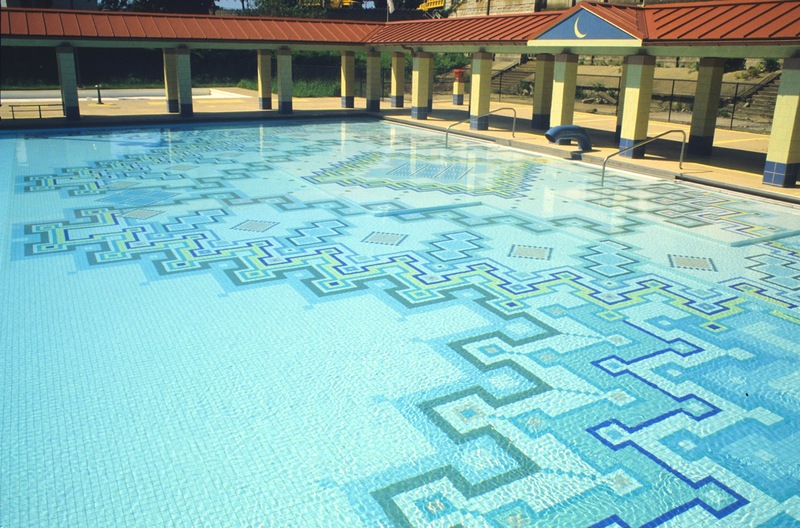 The 1987 art installation includes a red-roofed shade pavilion supported by columns and mosaic tile-work on the pool’s floor designed to shimmer underwater. At a gathering that drew about a dozen people to Baltimore City Recreation and Parks (BCRP) headquarters, officials explained the problem. 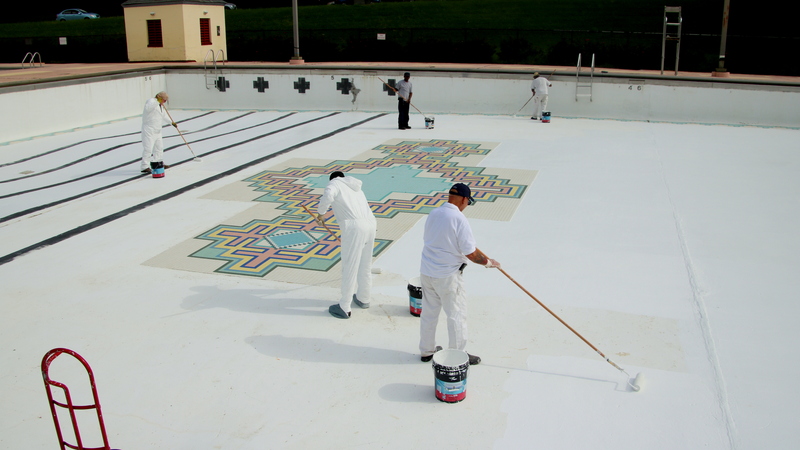 Although the pool itself is not going to be replaced under the proposed overhaul, they said, the pool’s tile must be removed because it is crumbling and cutting bathers’ feet. “Last year we had hundreds of cuts because of the tile,” said Darryl Sutton, BCRP aquatics director. “It degrades and cracks and it probably costs us close to $5,000 a year to reseal it,” Sutton said, speaking at a meeting at BCRP headquarters. 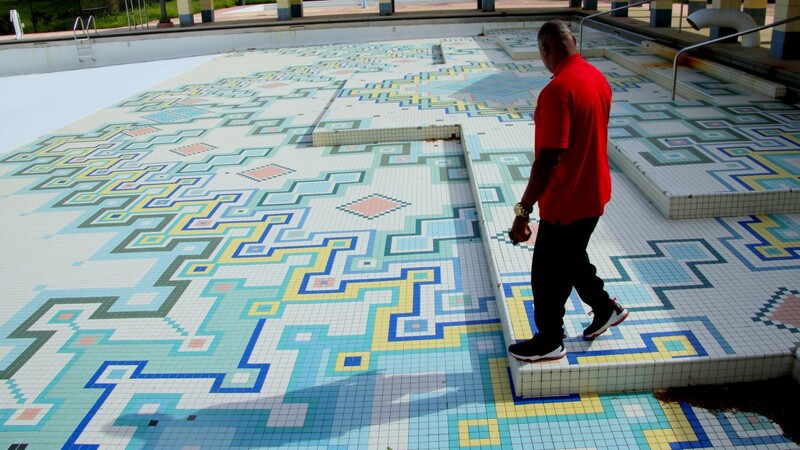 In addition to drying and cracking in the sun, Sutton said, the tiles are damaged by people who skateboard there in the off-season, climbing over the fence to get access. “We are looking to go to a newer form of art that is not so expensive to maintain,” he said. Pat Alexander, the artist who designed “The Oasis,” under a commission during the era when the late Christopher T. Delaporte was BCRP director, said she was disappointed to learn that it was being removed. “It’s a horrible precedent to destroy art without looking into creative solutions that could be found to preserve it,” said Alexander, a recently-retired Maryland Institute College of Art professor, speaking by phone with The Brew. Alexander said the design for the mosaic that she chose was meant to evoke North African tile patterns and that the entire installation was intended as cool, shady, oasis-like respite from Baltimore’s summer heat. Alexander said she is meeting this week with BCRP to learn more and see if some compromise can be made to preserve her artwork. Raising the same question at BCRP meeting about the pool project was Ryan Patterson, public art administrator at the Baltimore Office of Promotion & the Arts (BOPA). “Is any consideration being given to preserving the art?” Patterson asked. “We’re going to have a tough decision,” said Rec and Parks’ Will Anderson, citing the need to bring the pool deck into compliance with the American’s for Disabilities Act, among other considerations. Patterson noted that the city’s request to de-accession the art will be taken up by the Public Arts Commission at its meeting on May 17. “I don’t know that we can prevent it but they can say what their recommendation would be to the city,” he said. Along with concern about the removal of “The Oasis,” other issues that surfaced at the meeting had to do with design and and upkeep. Several questions were raised by members of the Fluid Movement aquatic performance art group. Among them was concern that the water slides shown in the schematic appear to dump sliders right out into the lap lanes. Matthew Ames, of the architectural design firm GWWO, said aspects of his company’s design are still being tweaked but that the pool’s water slide area would be 15-20 feet wide. Others raised the issue of maintenance and supervision, as the $6.5 million upgrade increases the pool’s maximum capacity from 300 to 500 and adds new features including a climbing wall, water slides, new shade structures and a new bathhouse. 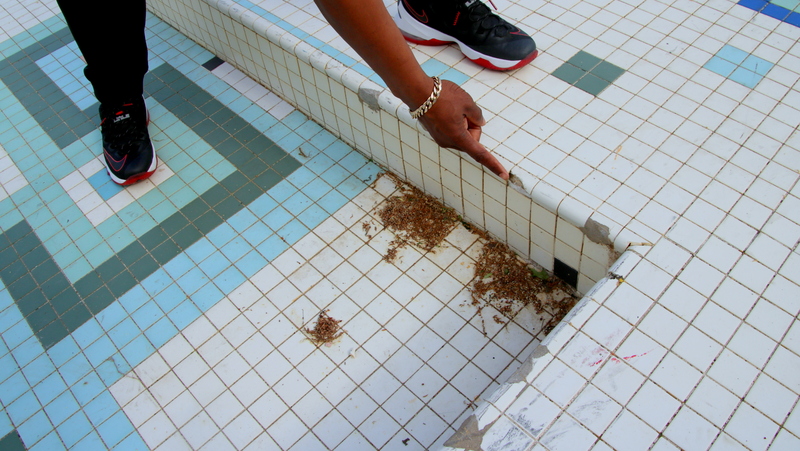 Fluid Movement founder Valarie Perez-Schere said city recreation facilities are often in poor repair and asked if the city had budgeted additional monies for supervision and maintenance. Sutton said he shared the audience’s concerns about maintenance. 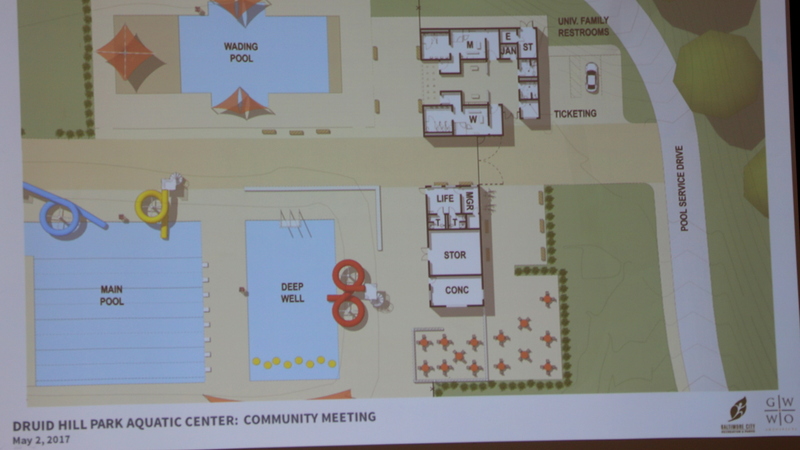 Anderson said BCRP hopes to defray the cost of the improvements by attracting more pool users. “You have to look at the demand, the kind of people this is going to bring in,” he said, noting that an additional 100 parking spaces are planned “wrapping around the tennis courts” across Wyman Park Drive. “You’re going to have people realizing [that] you don’t have to go out of the city to find a great water park,” he asserted.